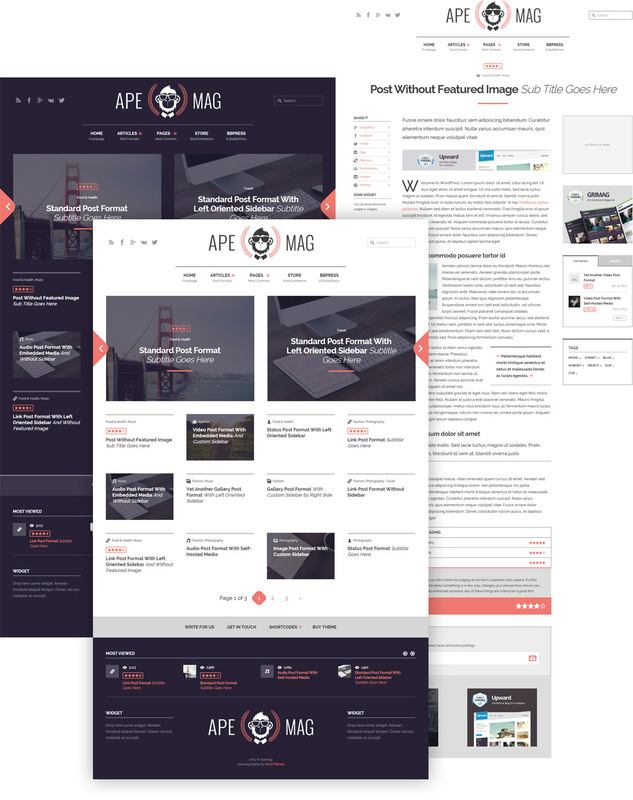 One of the most aesthetically modern magazine themes by StrictThemes, Apemag WordPress Theme boasts a visually balanced design that is ready for monetization. Apemag is best suited for a blog or magazine website, with attractive blogroll layouts and post formats. 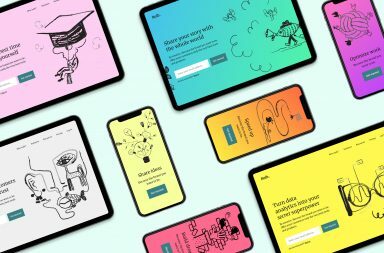 Advertising “hotspots” are dispersed strategically throughout the site layout to maximize earnings without interrupting the rhythm of the design or detracting from user experience. Apemag’s fresh and clean aesthetic has a youthful, modern feel characteristic of professional online magazines. The theme is highly customizable and offers an extensible and intuitive framework to build upon. Ultimately a content-driven theme, Apemag’s layout is perfect for article-focused sites with an emphasis on presentation and engagement. Apemag is fully responsive and will translate beautifully across all screen sizes and devices. A built-in solution for responsive AdSense units also ensures that ads will conform to mobile devices, maximizing exposure and revenue. Ad “hotspots” populate various areas of the site, presenting opportunities for both vertical and horizontal ads to be displayed. Boxed or Full-width layouts are available. This theme is ready for HiDPI environments and modern, retina screens. High-quality graphics are included to ensure the theme performs looks sharp on any device. Design-wise, Apemag comes with two default skins, light and dark. You can also create your own color schemes by choosing primary and secondary colors from an unlimited color picker within the theme options panel. Apemag is compatible with the Google Fonts library, giving you access to over 600 different fonts. Adjust typography settings within the theme options panel to give your site text a unique look and feel. Beyond advertising, several additional income streams are possible with Apemag. WooCommerce compatibility allows you to easily add an e-commerce element to your site. The Shop and Product pages integrate cohesively into the design of the site. The BuddyPress and bbPress plugins are also available for use with Apemag. Create forums and groups to grow your audience and create ongoing engagement with your content. Stylish forum page templates compliment the theme’s aesthetic. This is a great way to leverage interest in your site and boost earnings. Yet another potential income stream presents itself with the inclusion of a beautiful review system. Turn any post into a review easily using stars, points, or percentages to assign a rating. Affiliate marketers may find this feature particular useful as a way to review products or services. The potential to pair product reviews with video posts creates a powerful backdrop for building a modern review site. Apemag offers the ability to create unlimited sidebars for use throughout your side. Populate sidebars with widgets of your choice and assign specific sidebars to individual pages and posts. The flexibility to pair unique sidebars with each post or page makes Apemag highly customizable. Apemage utilizes the user-friendly ST Kit Framework, which includes several custom widgets, such as Flickr, Posts, Sharrre, Get in Touch, and Subscribe. The ST Kit Framework also comes with a lot of premium shortcodes. 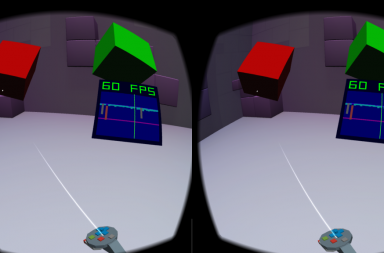 Add columns, buttons, tabs, and more. StrictThemes also offers extended documentation concerning shortcodes, complete with examples and step-by-step instructions. The ST Kit Framework includes a user-friendly admin panel that makes customization a breeze. Adjust colors, fonts, and layout quickly and easily from the theme options area. You can also add custom logos, branding, and a unique favicon from the admin area. The ST Kit Framework also makes it easy to import and export theme settings with a few clicks. 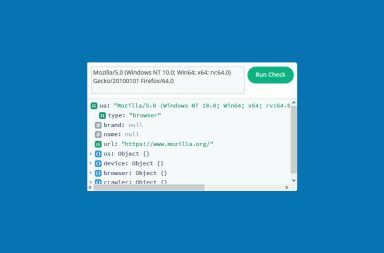 This is a useful feature for anyone interesting in utilizing the robust demo content provided with this theme, which provides an awesome starting point to built from. This theme is translation ready. It comes with a .po file containing all of the text strings used in the theme. Support for WP Custom Post Formats is included with Apemag, giving you the ability to create multimedia posts easily. Post formats offered by Apemag include Standard, Audio, Video, Quote, Link, Status, Image and Gallery. Audio and Video posts support embedded or self-hosted media. 140 unique glyph icons are included as part of the StrictThemes ST Kit Framework for use throughout the site. Built-in social media icons make connecting to various social networks highly intuitive without the need for a plugin. 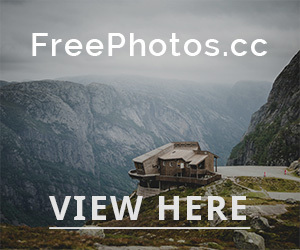 Featured images are not required for posts. Post thumbnails look great throughout the blogroll with or without featured images, and a combination of posts with and without featured images adds visual diversity to the blog page that enhances the overall aesthetic of the theme. Seven footer sidebar layouts are including, offering a lot of options for creating a unique site footer. Apemag was built with SEO best practices in mine, and the theme is optimized to perform well across search engines. If you do find a bug, StrictThemes offers free bug fixes. Simply contact the theme developer. StrictThemes offers one-click updates for this theme, allowing you to update directly from the WordPress Admin area rather than manually updating your theme each time. The theme developer is also committed to maintaining themes to be compatible with new versions of WordPress upon release, so that you will never need to worry about down-time surrounding updates. Apemag is versatile and optimized for monetization. The design and layout offer a great user experience, making this one of the best StrictThemes themes in terms of aesthetics. Two attractive color schemes give the light and dark skins a lot of value. The strategically placed, responsive ad units throughout the site are perfectly suited for targeted advertising that compliments the visual rhythm of the site. 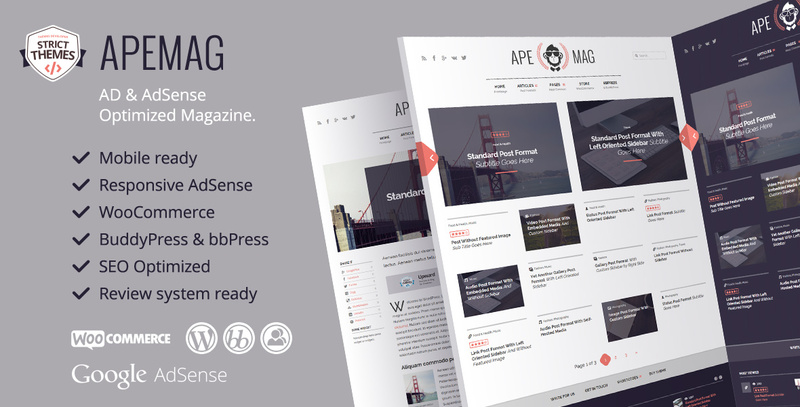 Compatibility with WooCommerce, BuddyPress, and bbPress carries Apemag above and beyond a traditional blog theme and offers powerful earning potential. Furthermore, the ability to add reviews is a desirable feature that opens yet another door for those looking to establish an online presence that brings in revenue via affiliate marketing. Apemag accomplishes exactly what it should: it provides an impressive, fully functional infrastructure and a fantastic design, leaving you to worry exclusively about content.